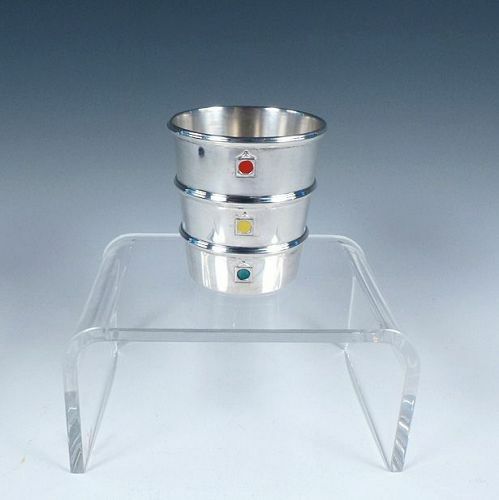 A vintage sterling silver figural jigger by Gorham, the sides marked off with enameled stoplights in green, yellow and red meant to signify "go," "caution," and "stop." Each light corresponds to the 1, 2-1/2, and 3-1/2 ounce markings on the jigger's bottom. This example is noticeably heavier than other Gorham stoplights we've had, suggesting that it's of an earlier date. The bottom is hallmarked by Gorham. Condition: very good; a very shallow 1/4" ding on the rim (to the left of the lights) and shallow 1/8" ding on the back side near the bottom.